This chutney recipe is the same that we use for tomatoes and other acidic fruits. After the tart I made with the cape gooseberries I was wondering about how to use up the rest of the fruit. I haven’t made this kind of sweet and sour chutney in a while. And the sight of the cape gooseberries reminded me of the first memories of tomatoes from my mother’s garden. No, they were not golden but the delightful freshness and the way some of the “vines” clambered up the bamboo fence in our backyard with large clusters of ripening fruit would have made any gardener proud. Much as the sight of these golden berries! And the recipe for this chutney is the same that we had as children, with tomatoes. The only addition I made is with the figs, or in other recipes scattered across my blog, it’s with the addition of pitted and soaked dates, prunes, apricots, and sometimes, raisins. There are other fruits that are made the same way. Indian olives, a variety of jujube, green mangoes, the fruit of the roselle, and elephant apples are some of them. Two ingredients for this dish came from my mother’s garden. Turmeric and the tej patta/Indian bay leaves. Soak the figs in warm water for about 15 minutes. Cut them lengthwise and set aside. 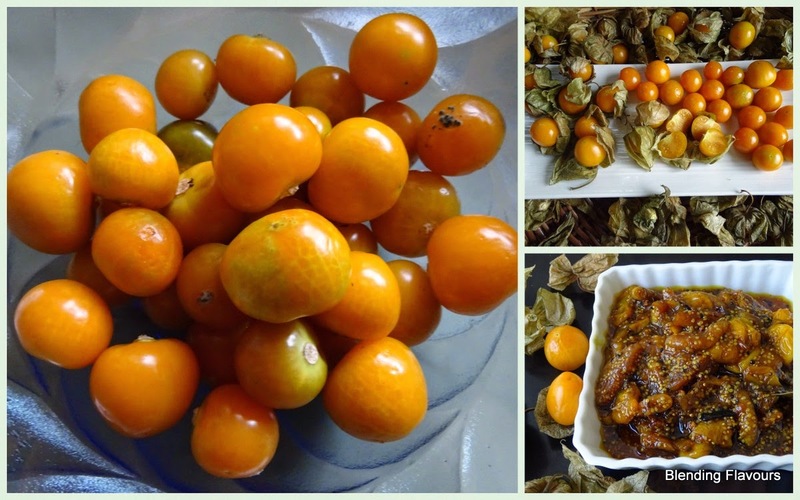 Wash the cape gooseberries. Halve the larger ones and make small cuts on the smaller ones. This will be easier for the berries to release their juices. Heat the oil in a pan. When it comes to smoking point, add the bay leaves and the panch puran. Break the chillies into bits and add them. Add the turmeric powder with a little sprinkle of water so that the spice does not burn. Stir. Add the other powdered spices too. Now the berries can go in. Stir in between. Let it cook till the juices are released and then start to thicken. Then add the soaked and cut figs. Season with salt. When it comes together, add the grated jaggery. As soon as the jaggery melts, the chutney will be done. During the last two minutes of cooking, add the tamarind pulp and give it a good stir. This is to balance the sweetness in the chutney. Turn off the gas and transfer the contents to a serving bowl. The bay leaves can be discarded at this point. It takes only about 12 to 15 minutes for the cooking to be done. Chilli powder can be added but today I used bird’s eye chillies and I didn’t want all that heat so I broke them into pieces. If you feel that it’s thickening up a bit too much, a little bit of the water used in soaking the figs can be sprinkled into the pan. Although this chutney forms part of a meal with rice, I like it best with puris. More so when dried fruits are used in the dish. In this case the quantity of sugar/jaggery can be reduced because of the natural sweetness in these dried ingredients.